Arriving in Baker, California we see the world’s tallest thermometer. This thermometer is 134 feet tall and was turned on October 9, 1992. Our moms are still looking on Roadside America, so we will be seeing the unusual in Baker. This is really unusual! 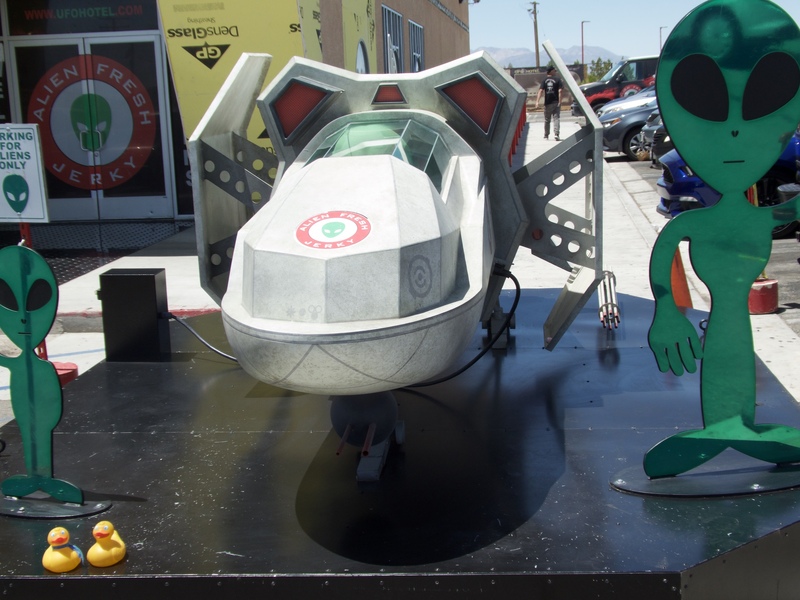 Aliens in the California desert? Yes indeed. 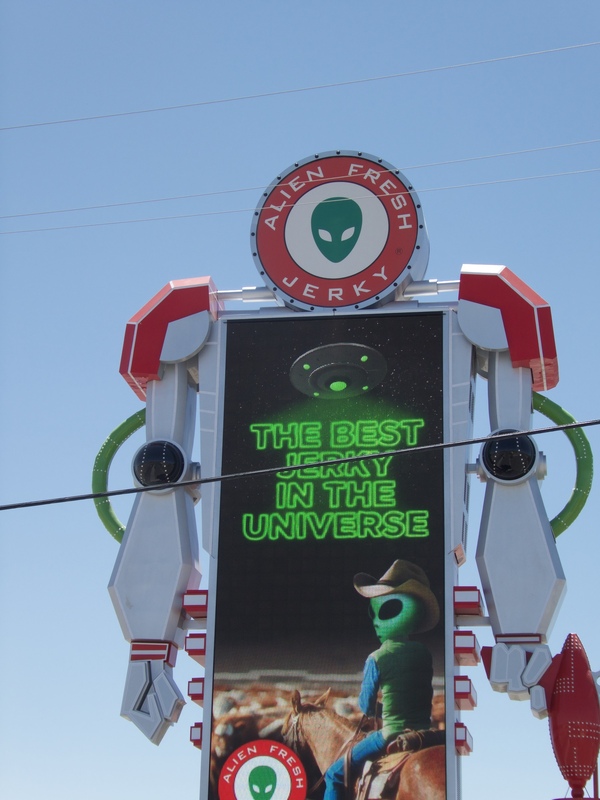 Across from the thermometer we wander around Alien Fresh Jerky. This sign also has a thermometer just under the pictures. Temperatures in the desert are of interest to tourists. We see aliens. They are driving, here, in our desert? Yes they are. And here is the vehicle they drive. Very futuristic, we ducks think. Inside this store, we saw and sampled many types of jerky. There are many varieties for humans to enjoy. Also lots of other snacks and beverages, and a huge souvenir selection. Alien t-shirts anyone? There are plans to open a 3 story saucer shaped motel here also. 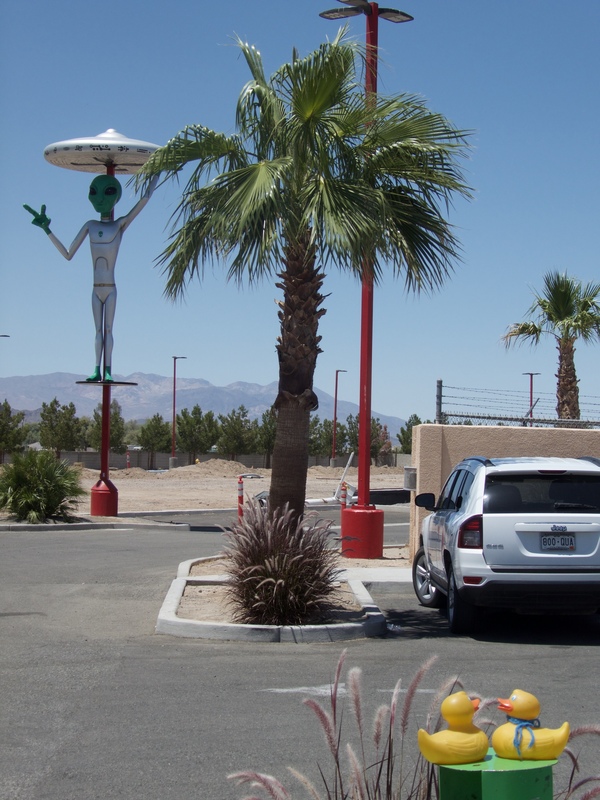 When it is completed, it will be advertised as “Gateway to Area 51.” Area 51 is in Nevada, and regular people are not allowed there. 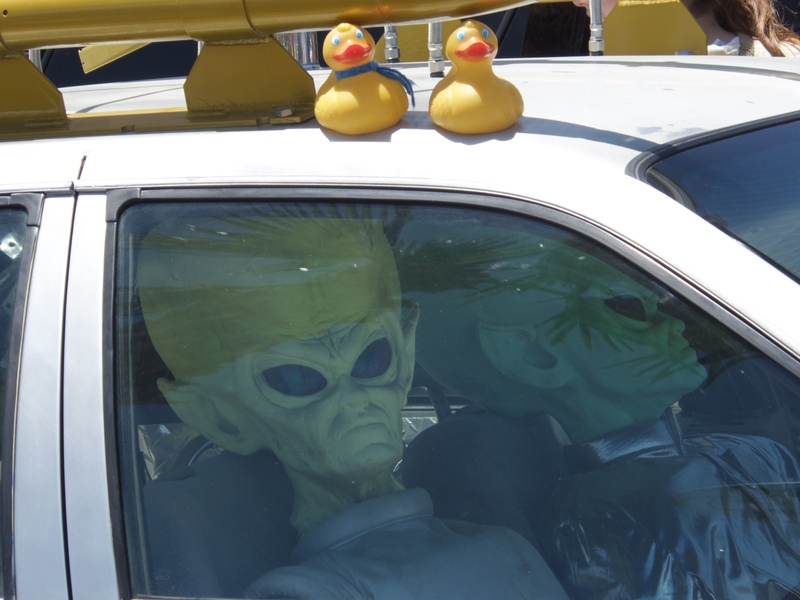 Rumors are plentiful of aliens in the area? If humans aren’t allowed somewhere, they seem to have great imaginations for the reason. We ducks won’t express our opinion, but if the area is ever open to the public, we will be there. 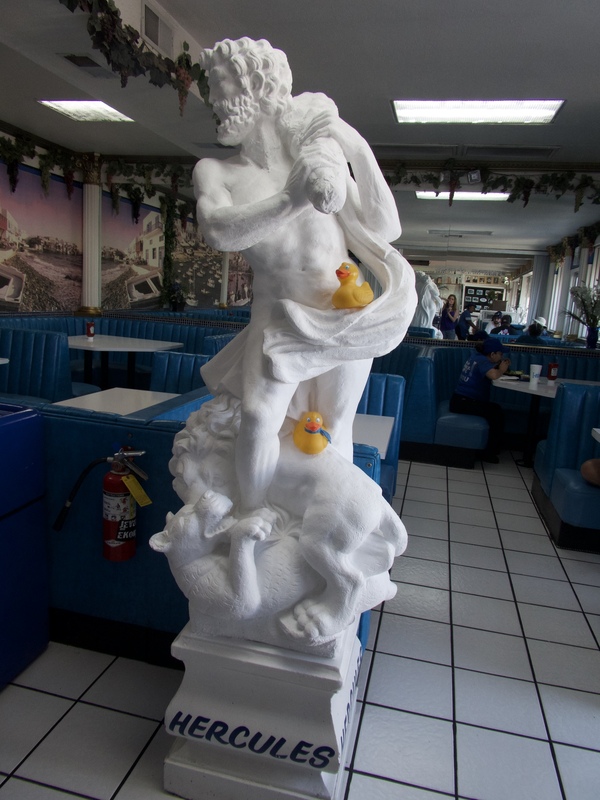 Humans like to eat, Roadside America had information on the Mad Greek Cafe, and here we are. 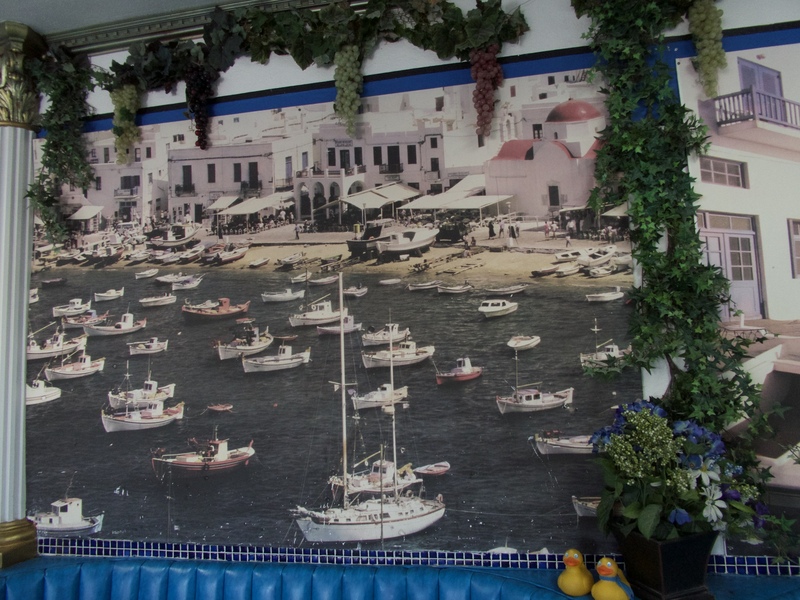 Inside, this restaurant looks like Greece. Or so our moms say. 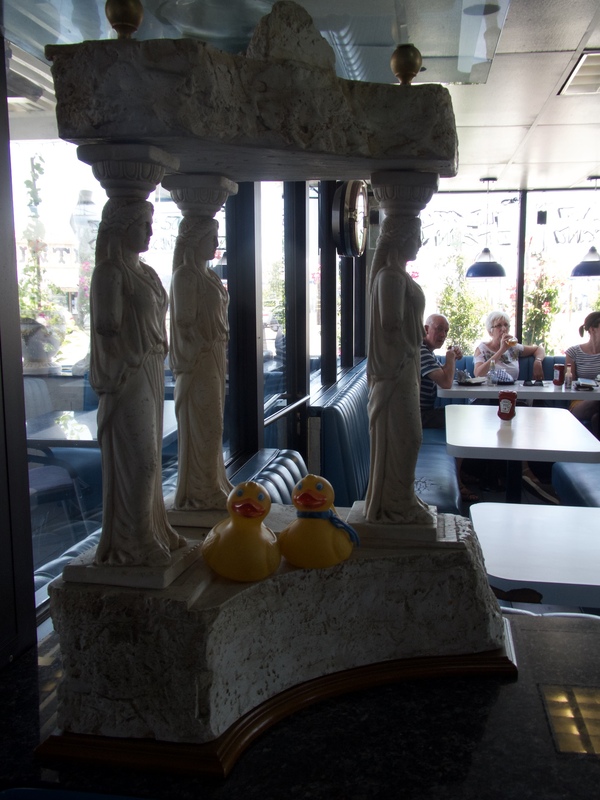 We ducks have not been to Greece, but our moms visited before we ducks were part of the family. Outside is the hot desert, but inside we gaze at this cool looking harbor. Great picture. A beautiful Greek harbor in the California desert. There are Greek columns and statues in abundance here. We really like this place, and the food was delicious and the prices were reasonable. 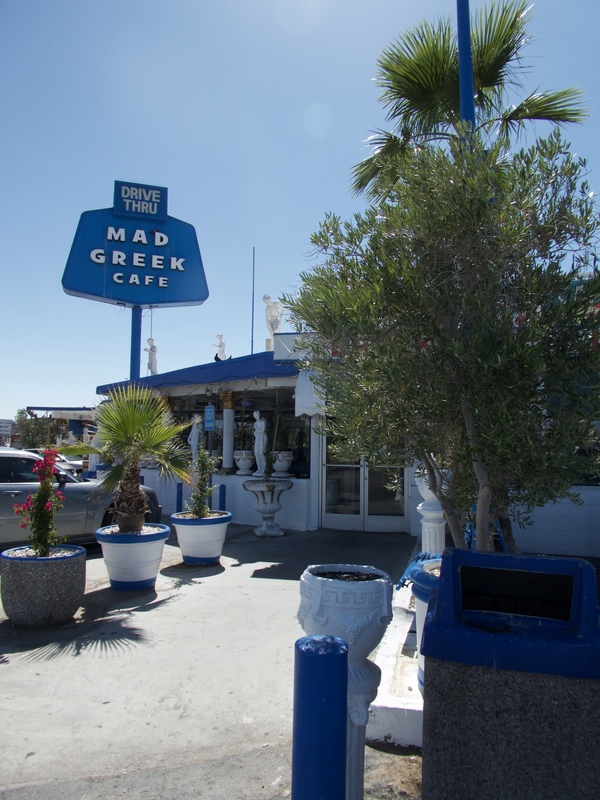 Next time we are here in the desert around Baker, California, we will enjoy another meal at the Mad Greek Cafe. Baker is on Interstate 15, the main road from Los Angeles to Las Vegas, Nevada. Back on the highway, we soon enter Nevada. Right on the state border is Hoover Dam and Lake Mead. We will join those other humans and take a look. 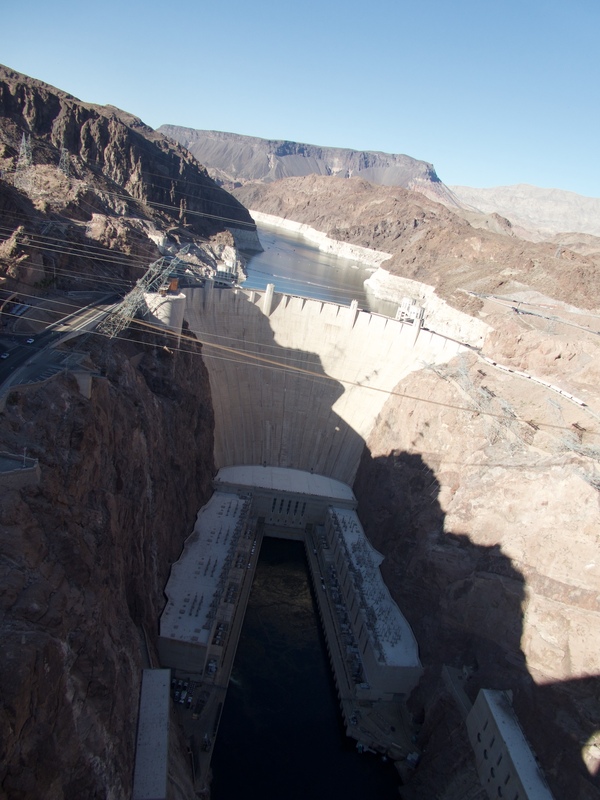 When the Hoover Dam was built, it was the highest dam in the world. Not now, though. Lake Mead is the biggest reservoir in the United States. This is what we saw from the walkway. This dam provides electricity for Las Vegas, Nevada. As you can guess, Las Vegas really needs a lot of electricity. We drove through Las Vegas, but did not stop. That will be a destination for another time. Leaving Nevada, we drove through a small part of Arizona, and then to Utah. 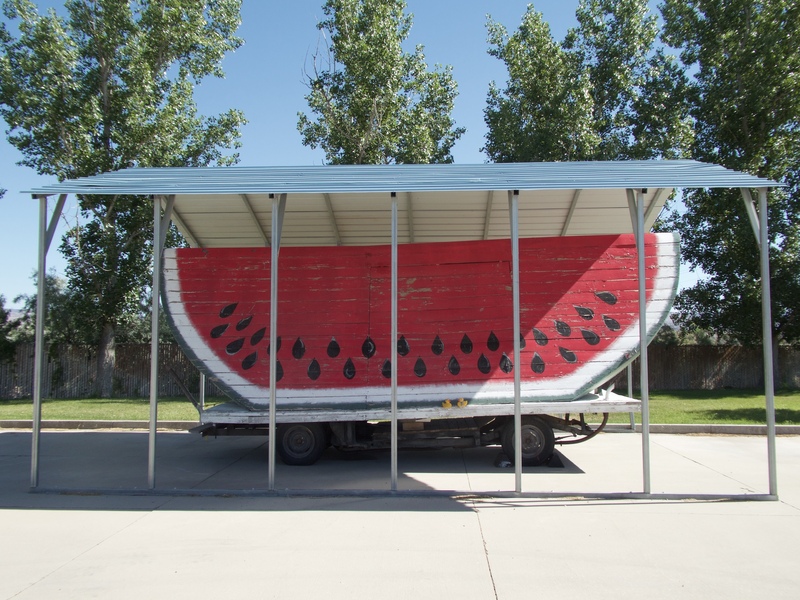 In Green River, Utah, we stopped to see the world’s largest watermelon slice. This watermelon slice was built in the 1950’s for Green River’s Watermelon Days Festival. For protection, it is under a roof. 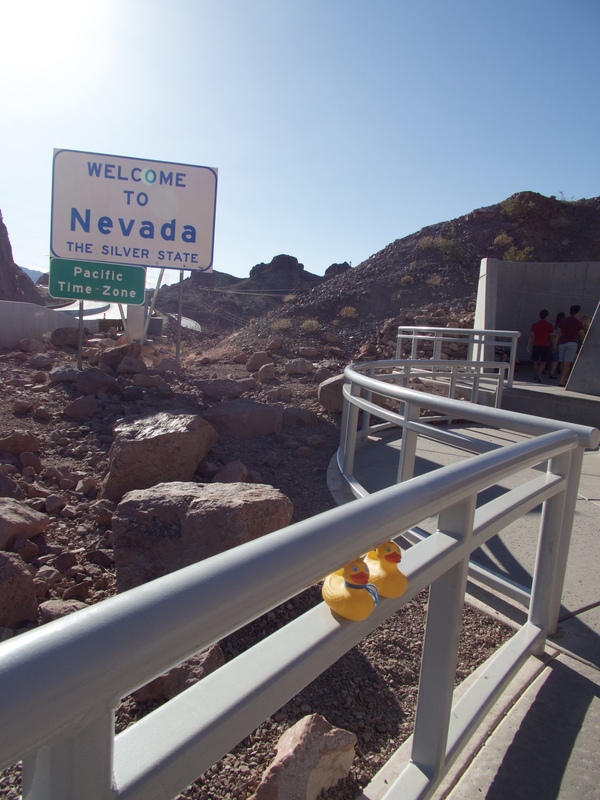 We ducks are learning to love Roadside America. We stop to see so many things we would miss, if moms didn’t look at http://www.RoadsideAmerica.com When you are driving, stop to see unusual things. We think you will enjoy it as much as we do.